If you regularly read this blog you know I love stripes. Is there really anyone who doesn’t? Well, I know people who don’t like pizza (isn’t it crazy?) so it’s possible that stripes are not everybody’s cup of tea. But for those who like them, how pretty is this Loveless dress? It’s a timeless and feminine day dress (made of cotton), a garment that will make you look well put together and chic. I particularly like the contrasting inner sleeves, the red fabric adds a pop of bright color. This dress is available also in red, with black contrasting inner sleeves. This Zara striped maxi shirt is the fashion crush of the week because I love stripes, I love puffy sleeves and I love maxi shirts that can be worn with leggings or as a dress. I also like belted shirts, I’m not nearly tired of them! A striped shirtdress is a summer must-have, unless you don’t like stripes and dresses, which I find impossible! This Topshop Unique shirtdress, named Dorney, is very cute. I like its clean lines, the classic tone of blue and the contrasting belt. Wear them during daytime and you’ll look casual and chic, wear them at the beach and you’ll look sophisticated. This Topshop dress will also be a good transition dress when the weather will be less hot. Wear it a bit unbuttoned with a pair of leggings and you’ll look great. This dress is available on Net-à-Porter and on Topshop, too. Petit Bateau is a brand that reminds of my childhood, I used to feel so chic when I wore its clothes (I admit, as a child I was a real fashion victim). This Petit Bateau top is lovely. As a huge lover of stripes and bows (and Petit Bateau) I easily chose it for the Fashion Crush of the week. I prefer the blue and lurex gold version but it’s available also with lurex red stripes. Summer is basically over and it’s time to think about transitional outfits and garments. This Oasis striped sweater is perfect, because it’s made of cotton and viscose. I wrote about my love for stripes many times so I find this sweater very cute and I like the collar. L’estate sta finendo (e ne sono contenta, è stata troppo calda!) ed è tempo di pensare ai vestiti per il periodo di transizione. Questa maglia a righe di Oasis è un capo perfetto, perché è in cotone e viscosa. Ho già scritto tante volte del mio amore per le righe quindi questa maglia mi piace molto, anche per il dettaglio del colletto. The weather seems to be even crazier these days. As I’m writing, in my town spring seems to be just around the corner while we should be in the middle of winter. While shopping (most of all online) I’m sure that we all take a look at both sales and spring clothes. So this week Fashion Crush is a mix. 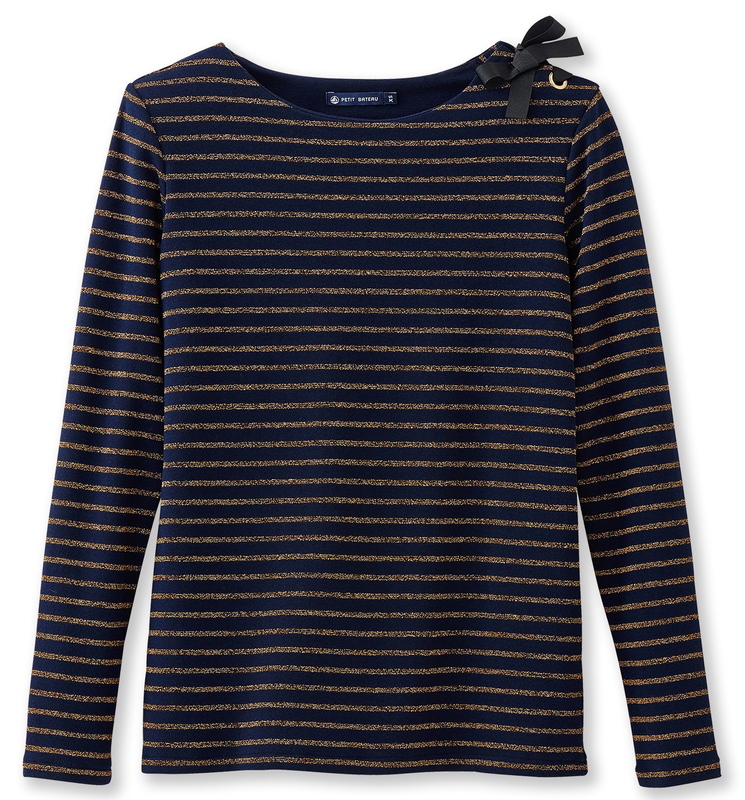 As a huge lover of stripes and embellishments I couldn’t help but falling in love with this t-shirt by J.Crew. It’s a garment perfect for spring but on sale and I think it’s absolutely cute. Stripes are a classic and the embellishment adds a chic detail, which makes this t-shirt perfect 24/7. Il tempo sembra più pazzo del solito ultimamente. Mentre scrivo nella mia città sembra che la primavera sia dietro l’angolo mentre dovremmo essere in pieno inverno. Facendo shopping (soprattutto online) sono sicura che diamo un’occhiata sia ai saldi sia ai vestiti per la prossima primavera. Così la Fashion Crush di questa settimana è un mix. Da amante delle righe e dei decori non potevo non innamorarmi di questa maglietta di J.Crew. Perfetta per la primavera ma in sconto, la trovo assolutamente carina. Le righe sono un classico e il decoro aggiunge un dettaglio chic, che la rende adatta da mattina a sera.